My Sprint App Not Working On iPhone? Here's The Fix! You are at:Home»iPhone»Apps»My Sprint App Not Working On iPhone? Here’s The Fix! My Sprint App Not Working On iPhone? Here’s The Fix! You’re trying to log into your My Sprint account from your iPhone, but something’s not working right. Formerly known as the Sprint Zone app, the My Sprint app allows you to access your carrier account directly from your iPhone. 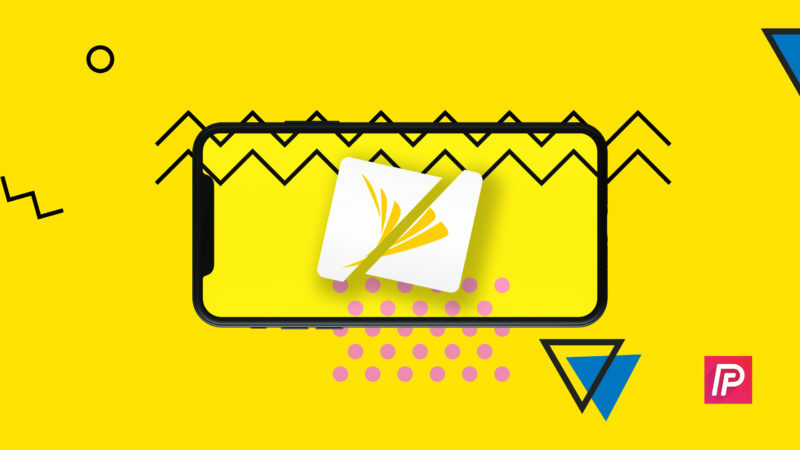 In this article, I’ll show you what to do when the My Sprint app is not working on your iPhone! A lot of the time, a small software glitch is the reason why the My Sprint app is not working on your iPhone. Closing and reopening the app will give it a chance to start again fresh. Begin by opening the app switcher, which will show a preview of all the apps currently open on your iPhone. On an iPhone 8 or earlier model, double-click the Home button to open the app switcher. On an iPhone X, swipe up from the bottom to the direct center of the display to open the app switcher. To close the My Sprint app on your iPhone 8 or earlier, swipe the app up and off the screen. On your iPhone X, press and hold the app preview until you see a small minus button appear in the upper left-hand corner of each app preview. Then, either tap the red minus button or swipe the My Sprint app up and off the screen to close out of it. 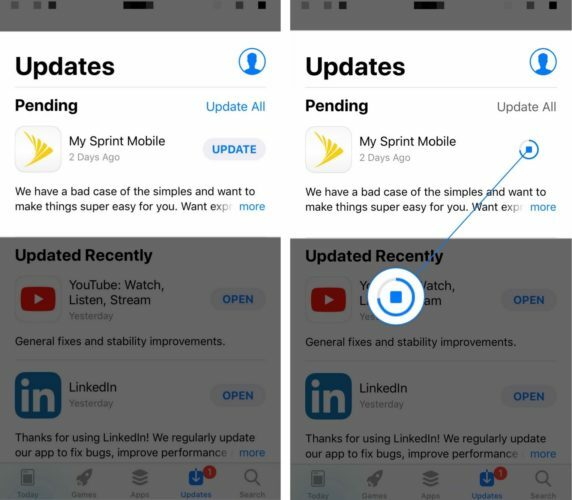 If closing the app didn’t work, your iPhone may be experiencing a different software problem not caused by the My Sprint app. 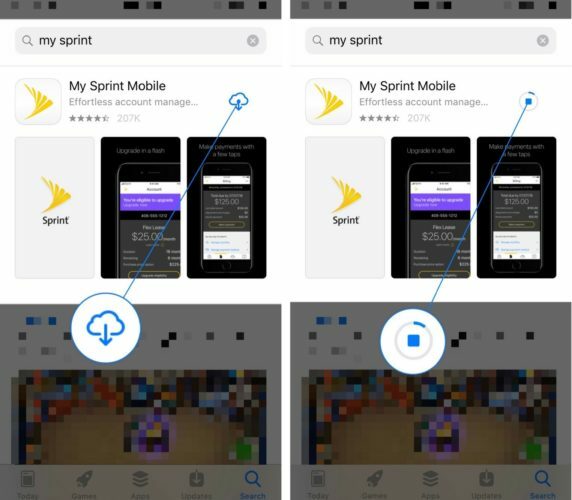 If a different app has crashed on your iPhone, the My Sprint app may stop working too. Restarting your iPhone will give its apps and other programs a chance to shut down naturally and start again fresh when your iPhone turns back on. To turn off your iPhone 8 or earlier, press and hold the power button. Then, let go of the power button and swipe the power icon left to right when slide to power off appears. The process is similar on an iPhone X, except you press the side button and either volume button until slide to power off appears on the display. Another reason why the My Sprint app may not be working is because it’s outdated. Sprint often releases updates to their app in order to improve security, add new features, or fix software bugs. To check for an update to the My Sprint app, open the App Store and tap the Updates tab at the bottom of the display. Look for My Sprint Mobile under Pending Updates. If an update is available, tap the UPDATE button to the right of the app. Afterwards, a status circle will appear next to the app to let you know how much longer the update will take. If an update isn’t available, but the My Sprint app still isn’t working, you may have to delete and reinstall the app like new. 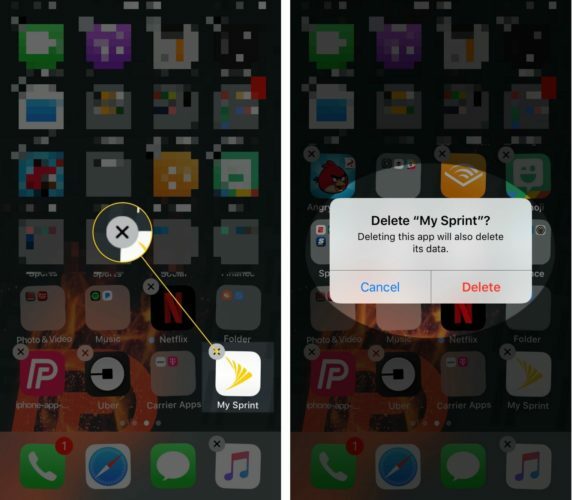 If there’s a more significant software problem with the My Sprint app, deleting and reinstalling the app will give it a completely fresh start. 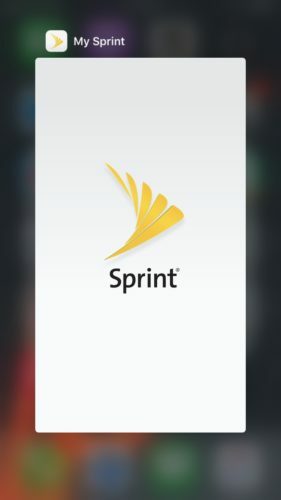 To delete the My Sprint app, gently press and hold the app icon until your apps begin to jiggle and a small X appears in the upper left-hand corner of the app icon. Tap the small X, then tap Delete when the confirmation alert appears on the center of the display. Now that the My Sprint app has been deleted, open the App Store and search for the app again. Once you find it, tap the download button to the right of the app. Since you’ve installed the app before, it’ll look like a cloud with a small arrow pointing down. After you tap the install button, a status circle will appear to let you know how much longer the install is going to take. If you’ve reinstalled the app, but you still can’t access your account from your iPhone, it’s probably time to contact Sprint’s customer support team. You can either call 1-888-211-4727 or visit Sprint’s customer support web page. The My Sprint mobile app is working and you can access your account from your iPhone once again. Next time the My Sprint app is not working on your iPhone, you’ll know how to fix the problem. If you have any other questions about your cell phone plan, feel free to leave a comment down below! Previous ArticleT-Mobile App Not Working On iPhone? Here’s The Real Fix! Next Article The MyAT&T App Isn’t Working On My iPhone! Here’s The Real Fix.